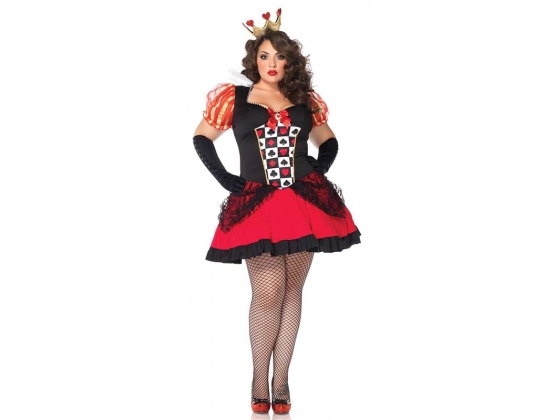 Wicked Queen Costume by Leg Avenue displays power with an Alice in Wonderland theme - break hearts all over. From the best online costume and lingerie store. This Royal Wicked Queen Costume will ensure a great poker hand and a possible flush. The costume includes a peasant style dress with a playing card checkerboard pattern. Displaying the extravagence of being a queen, there are puffy shoulders that are rich with the colours orange and gold. The skirt is red and layered with a black hemline aswell as a lace top. Set includes golde crown with heart detailing. Leg Avenue is a trusted and reliable brand who produces costumes, lingerie, hosiery and accessories. With over 19 years of industry knowledge, they inspire to create lavish clothing collections using a vast range of materials. Use their clothing to create new memories of intimate moments or to attend functions. Leg Avenue sell their products worldwide at affordable prices.